In his last blog from Helmand province Lieutenant Colonel Tim Purbrick, spokesman for Task Force Helmand, looks to the landmarks of his tour, including the Royal Wedding, the death of Osama bin Laden, the 10th Anniversary of 9/11, the transition of security in central Helmand and a visit to troops by Cheryl Cole. 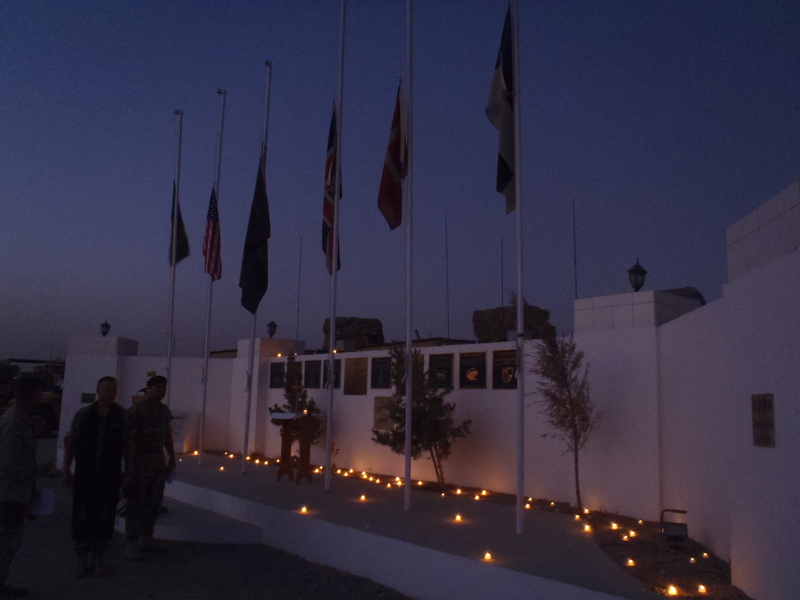 In Lashkar Gah we held a candle-lit memorial service on the 10th Anniversary of the 9/11 attacks in the United States during which 68 Britons lost their lives, the largest single loss of British life in a terrorist incident. It was a poignant reminder of the reason why we came to Afghanistan in the first place and the reason why we remain here now to ensure that Afghanistan can never again be abused by international terrorists to launch attacks against us or anyone else. In my toughest task to date here in Helmand I reassigned myself to minding the media covering Cheryl Cole’s visit to Camp Bastion. Cheryl Cole, for those who don’t know, is a popular music performance artist and latterly a judge on the television talent show, the X Factor. Cheryl was out in Helmand to present the Daily Mirror’s Pride of Britain Award to Brig Ed Davis, Commander of Task Force Helmand, on behalf of all the troops who have served in Afghanistan over the last ten years. As we had Cheryl on the base for two days we thought that we would show her the full range of military capabilities used here in Helmand and, more importantly, introduce her to as many of the troops as she could meet in her 48 hours with us. So, with only a few hours kip (when our troops get a day off on arrival), in 35 deg C of heat, at 3,000 ft (as high as Ben Nevis) and on her first introduction to the military, Cheryl Cole embarked on an ambitious and demanding programme of meeting, greeting, posing for photos, signing her autograph and taking part in a huge range of military activity. Cheryl started by meeting the Brigade Reconnaissance Force where she fired a 30mm Rarden cannon on a 9th/12th Royal Lancers’ Scimitar 2 Light Tank, fired a Grenade Machine Gun on a SCOTS DG Warthog, and held a Brigade Patrols Troop Royal Marines sniper’s rifle before driving a Jackal patrol vehicle. She went on a foot patrol with 1 RIFLES, which included some ‘grand nationalling’ when compound walls, like fences on the Grand National, are climbed over using ladders, unlike the Grand National – and attended a ‘shura’ or meeting with Afghan elders. Armed with an SA80A2 assault rifle, Cheryl then practiced room clearance drills with 42 Commando before assisting the Marines with the evacuation of a casualty on a stretcher to a Medical Emergency Response Team’s RAF CH-47 Chinook helicopter – which totally covered her in dust from head to foot when it flew in. After lunch – at every meal she had in Camp Bastion Cheryl shared the table with at least 20 different Service personnel each time – she blew up Simon Cowell with 10kg of military P4 high explosives which she seemed to find an entirely enjoyable afternoon activity. Then it was on to join a Combat Logistic Patrol and recover a vehicle hit by an Improvised Explosive Device. Later on that evening she met the Task Force Engineers, the ‘ISAF slaves’ who have worked so tirelessly for both us and the Afghans for the last six months. The next morning we went to the Afghan National Army camp where Cheryl met General Shirin Shah, the Commander of the local Afghan Brigade, and 3 MERCIAN soldiers from the Brigade Advisory Group. Then she flew from Camp Shorobak to Camp Bastion in a Royal Navy Seaking helicopter, visited the UK helicopter flight line and sat in an Army Air Corps Apache AH-64 attack helicopter for a ground based flying lesson. Over at the RAF Regiment’s Force Protection Wing, the Tongan Marines put on a Sipi Tau – the Tongan equivalent of a New Zealand haka – which was quite awesome. 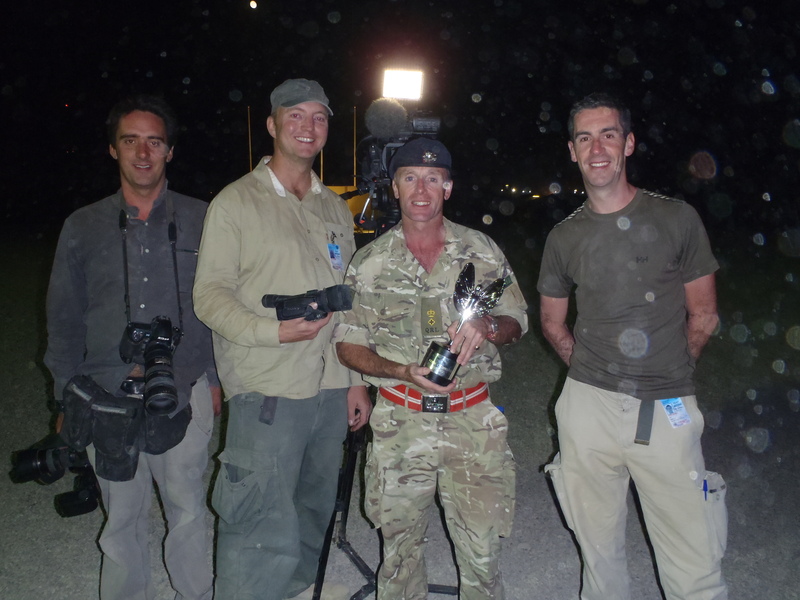 Rowan Griffiths (Daily Mirror), Charlie Kinross (ITV), Lt Col Tim Purbrick with the Pride of Britain Award, and Matthew Hinchcliffe (ITV) at the Awards ceremony in Camp Bastion. The ITV crew filming Cheryl for the Pride of Britain Award asked the Tongans to do it again so that they could get some additional shots for the Awards ceremony and I stood where Cheryl has stood moments before, getting the full benefit of the Sipi Tau. Cheryl was driven down to the front gate of the base to see the search dogs checking supply vehicles coming into camp and she spent the afternoon with the Counter-Improvised Explosive Device Task Force (C-IED TF) where she appeared to be amazed by their work and the individuals in the C-IED TF, known as the ‘bravest of the brave’. It was a programme that would have been enough to flatten most people but Cheryl Cole, who is a very pretty girl with a wonderful smile that never left her face, was interested in what she was being shown, asked good questions, took a real interest in the people she met and was often visibly moved by those people (who wouldn’t be), and she did not stop for the two days of her programme. She totally connected with our young Service personnel, oozed feel-good-factor and made all who she met very happy. I gave her two gifts to remind her of her visit. First, I asked the Geo Department – the military cartographers – in Task Force Helmand to print off a map of central Helmand which most of the headquarters staff in Lashkar Gah then signed. There were not only signatures on the map but also some additional comments and at least one mobile phone number. The other gift was a charity bracelet made by Afghan women in their centre at Gereshk, in the Nahr-e Saraj District, which I had bought when I was at Camp Price, the Danish base. It’s made of paracord with a gold Danish military button and when I put it on Cheryl Cole’s wrist I added my name to the long list of those who have given Cheryl Cole expensive jewellery – well, it was ten bucks. However, my three daughters then wanted one too, so it really did cost me. It never for one second crossed my mind when I started my tour as the Spokesman for Task Force Helmand that I would be returning home as a card-carrying member of the Cheryl Cole Fan Club. But, I am. 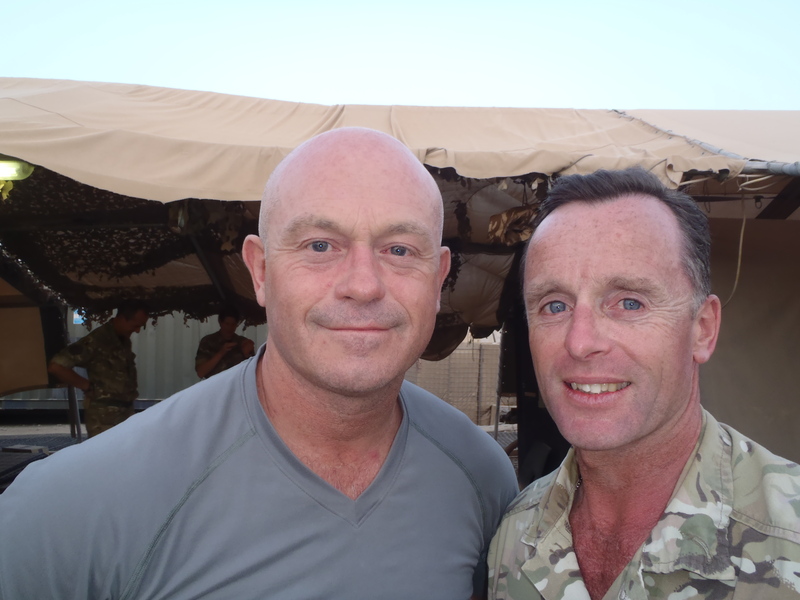 It was a bit of a ‘celeb’ few days in Bastion as I also caught up with Ross Kemp at Camp Bastion’s Joint Media Operations Centre. Ross was over in Helmand filming his latest documentary and had spent some time with the Afghan National Army on Operation Eastern Fortress into insurgent territory just east of Lashkar Gah City. Robert Fox – the Evening Standard’s ‘Falklands Fox’ – was in the Joint Media Ops Centre as well. Robert had been travelling all over Afghanistan gathering stories for the Standard on development issues, in the main, though he was very happy to do one on Cheryl Cole too. Then I had ‘ground rush’ towards the end of my tour, which I had started to feel on my return from R&R. In a short time I had said goodbye to Headquarters staff, handed over the Spokesman’s role to my successor and I was on my last RAF CH-47 Chinook flight from Lashkar Gah to Camp Bastion, where I handed back all my companions for the last six months – bullets, 25kgs of body armour, morphine, tourniquets, as well as packing up my rifle for the long journey home. 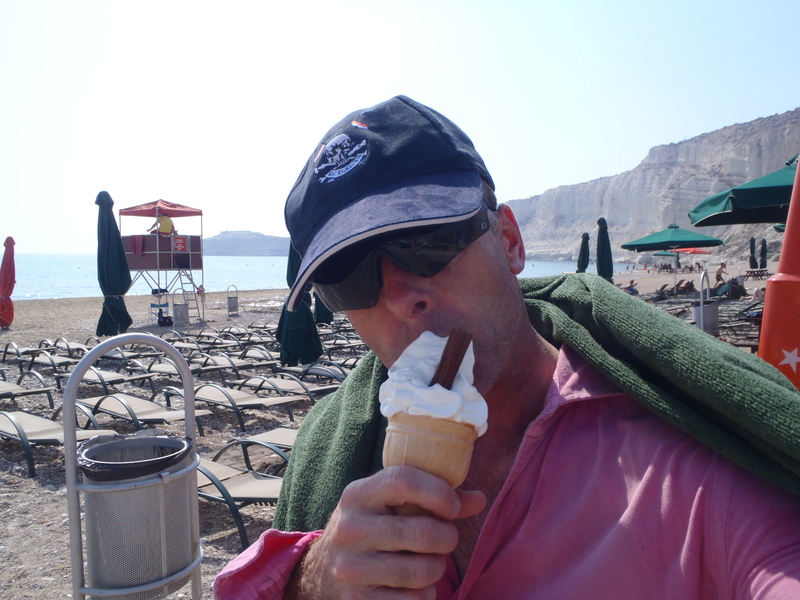 We travelled via Cyprus for a day of ‘decompression’ which I spent dingy sailing, swimming, eating ice cream, and enjoying a barbeque and a Combined Services Entertainment show before flying the final leg back to RAF Brize Norton in Oxfordshire. Looking back I feel very privileged to have been the Spokesman for 6,500 Royal Marines and troops on the military mission in Afghanistan. My highlights in Helmand have been patrolling with L Company, 42 Commando in Loy Mandah Kalay, getting to know our Afghan partners in the police, Army and Government and the Lashkar Gah media, seeing many old, and making many new, friends, escorting the national media, going ‘live’ on Sky News, swimming in the British Embassy pool in Kabul, putting out the story about the Afghans’ elite counter-terrorist unit, Bost 170, walking the search dogs in the morning around our base in Lashkar Gah and, of course, Cheryl Cole. There have also been some pretty big events which happened during our shout – the Royal Wedding, the death of Osama bin Laden, the 10th Anniversary of 9/11 – along with the seminal moment of Operation Herrick 14, that handshake on 20th July between Brig Ed Davis and Brig Gen Hakim Angar, the Provincial Chief of Police, when we crossed the bridge between gaining, holding and consolidating the security of Central Helmand, and the future that is the transition of lead security responsibility back to the Afghans, opening the door to our eventual exit from military operations in Afghanistan at the end of 2014. Our mission from now on is all about ‘less-to-none’ of us and ‘more-to-all’ of them, said the Spokesman. We will never forget the sacrifice made by those who didn’t return with us or those whose lives have been changed by injuries suffered on the battlefield. As a Reservist, my time is nearly up, my mid-career break is nearly over, my mid-life crisis is nearly overcome and I will shortly be heading back to ‘Civvy Street’ to look for a new job. Thank you for sharing the Herrick 14 journey with me. This entry was posted in TFH HQ. Bookmark the permalink. Is Tim Purbrick related to my old O.C. Reggie Purbrick, B Sqn. 17th/21st Lancers? Have a safe trip home. God Bless. I LOVE YOU GUYS LIKE MY MOTHER AND WILL ALWAYS ACCEPT YOU AS MY BROTHERS.GOD BLESS THE BRITISH ARMY.I WILL JOINING THE ARMY SOON. Your blogs have been well worth reading and have kept me up to date with events in Afghanistan, to read your views has been very interesting and I will miss your blogs. Thank you Sir for sharing your views which have been honest and open, I wish you well in your new venture and wish all our troops a happy home coming after Herrick 14. Colonel Tim, glad to hear you stayed under the radar. I hope you had a good tour and very happy to see you are back in Blighty safe and sound. Have really been interested in your reports in The Blackmore Vale magazine, gives a different perspective to the work all the forces are doing out there. Give my regards to all the personnel who are there protecting everyone.